Iowa. I've lived in Eugene since 1982. I love beads. I have owned and operated Harlequin Beads & Jewelry since 1984. I have three great kids. I've loved beads and been beading since I was 13 years old. There was a little store called Macrame Plus in my neighborhood with a bead stringing table. I adored math and fell in love with peyote stitch. I love to graph patterns. I love antique African trade beads, fancy gem beads and rocks, everything Italian, crystal, seed beads, antique glass - to name a few favorites. I like to knot with stone beads and crystals, and make Buddhist malas (knotted). I used to do a lot of seed bead work with teeny-tiny Italian seed beads. Right now, I am enjoying learning to photograph beads and jewelry. I knot in front of the TV, sometimes design and string stones at work. I only make stuff when I am inspired by some beads. My bead collection is vast and unorganized; things are vaguely arranged in piles by type. I'm inspired by the craftsmanship and beauty of the beads. Stone beads are mined, cut, matched and strung by hand. I love the intricacy and beauty of antique beads. I'm pretty much self-taught. When I first started beading, I learned a lot from watching others. Now, I just learn by doing. I like to wear rare and unusual beads on a daily basis, regardless of whether or not they go with my "outfit" (or t-shirt). I was inspired to open a bead store in Eugene in 1984 by my friends and local artists. There has always been an abundance of talented beaders in Eugene, and back then there was no good bead store to serve their needs. I did a pair of peyote stitch earrings with size 18° Italian seed beads, and long fringe with opals, rubies and amethysts. 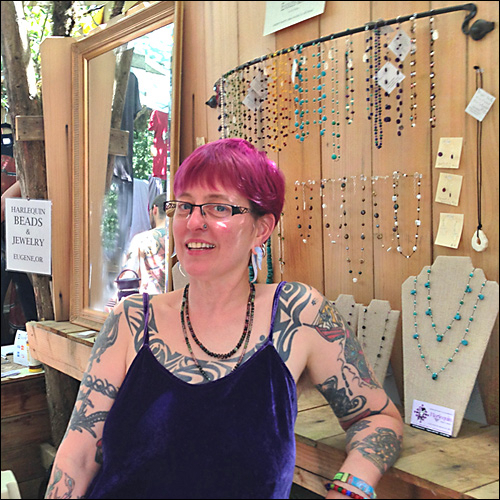 My floating bead necklaces are available at Harlequin Beads & Jewelry store, and I have an annual booth at the Oregon Country Fair in Veneta. Use your imagination. There is no limit to what you can do with beads. The beads are highly addictive.